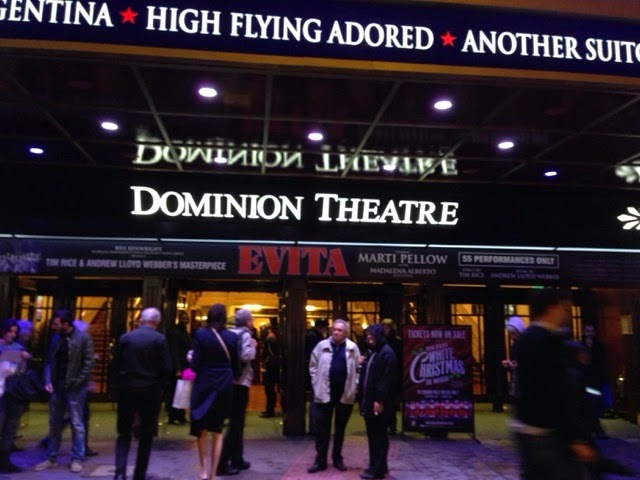 Yesterday I went to see Evita which has been revived in the West End but only for a limited season of 7 weeks at the Dominion Theatre. 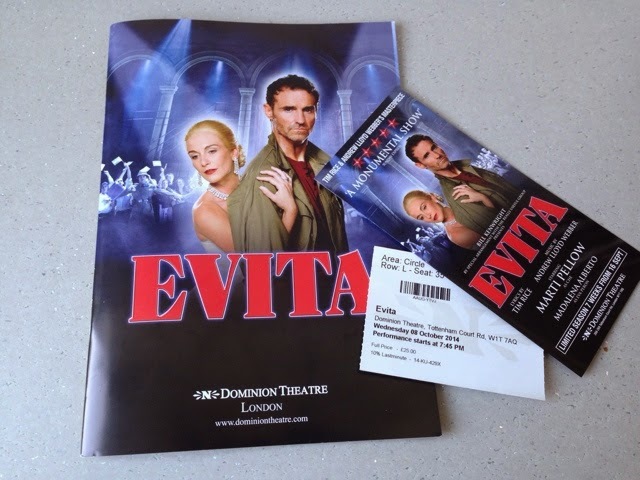 Evita, the musical has always been a favourite of mine, ever since the film version came out in 1996 starring Madonna as Eva Perón and Antonio Banderas as Che. It was at a time when I was attending theatre school, with the hope of one day being able to get into musical theatre. I used to watch the film (that I had on VHS!) with the subtitles on all the time, so I could learn all the songs - my all time favourite was "Another Suitcase in Another Hall". Playing the lead in this production is Madalena Alberto who also played Fantine in the 25th anniversary production of Les Mis. The role is shared with Michelle Pentecost on certain performances and that is who I saw yesterday - A brilliant performance and voice. Che is played by Marti Pellow of Wet Wet Wet, who although has done musicals before (Chicago), I found his pop voice wasn't really suited for the theatre - it needed more diction and at times it seemed like he struggled with the high notes. You may already be very familiar with this true rags to riches story of the woman who some ended up naming Santa Evita. If you have already seen the film, it is told in the same way with Che's critical and often funny, scathing narration of Eva Perón, which is supposed to reflect the voice of the Argentine people. There are plenty of high octane dance sequences, with the Argentine Tango and Paso doble beautifully carried out by the chorus line. The storyline moves swiftly and starts with a scene where cinema patrons have their film interrupted to be told the news of Evita's death. You see the national outpouring of grief and Che appears singing "Oh What A Circus" before it then goes back in time and show's Eva as a young, very ambitious girl who just wants to be a star. 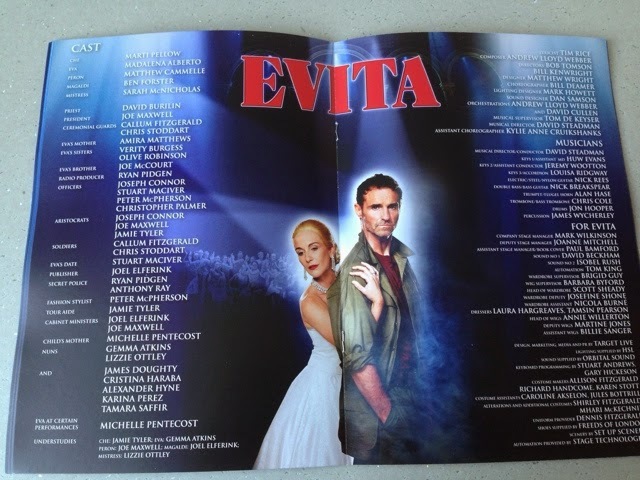 I really liked how Michelle Pentecost played the role of Evita. She was believable as a steely, determined woman, from humble beginnings who climbed up through society into extraordinary wealth, power and status. One of my favourite lines in the show "They must adore me, so Christian Dior me!" came as she was getting ready to address her people....It's a line that I have to steal and find a way to use it in my normal life!! I do wonder how much of this depiction of Eva Perón is true...it reminds me of other real life "rags to riches" stories like Princess Diana and Princess Grace of Monaco...some people loved them and some just refused to accept them because of their background. If you haven't seen this musical yet, you really must do as it probably will not be back in the West End for a long while after this. 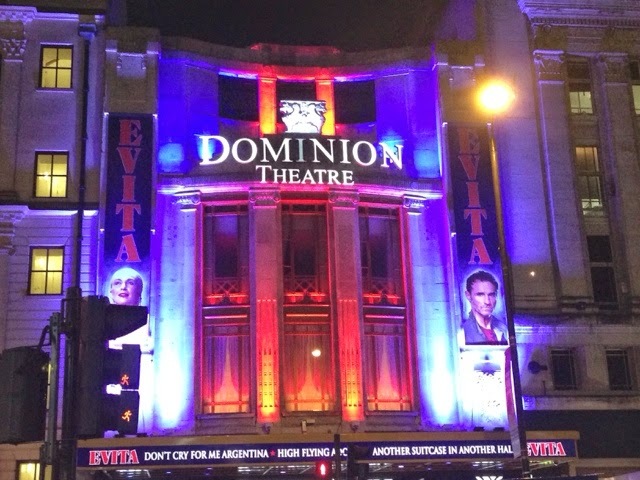 It is only on at the Dominion Theatre until the 01st November - there are some great deals on at LastMinute.com at the moment, so make the most of it!